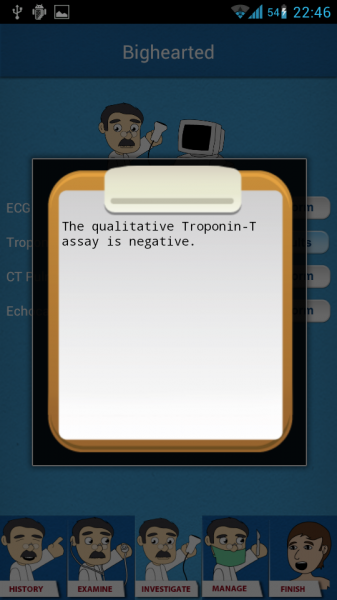 The purpose of this review is to answer the question whether Prognosis: Cardiology is an app that can help physicians practice their cardiology skills. 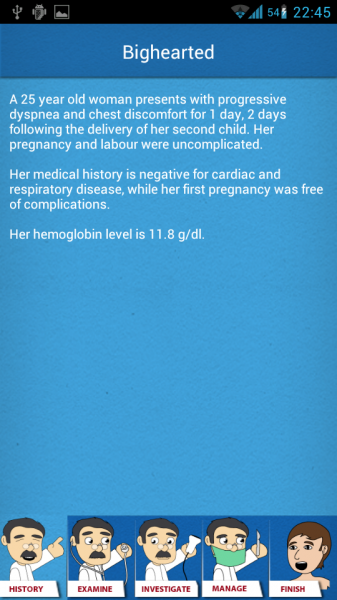 Medical Joyworks’ “Prognosis: Your Diagnosis” has been around for quite a while for the iPhone and Android. Prognosis: Cardiology is part of a series of steps they have taken to specialize their apps and tailor them to specific needs. This app is a Clinical Case simulator that aims to provide an entertaining experience as well as a practice platform to keep professionals sharp. 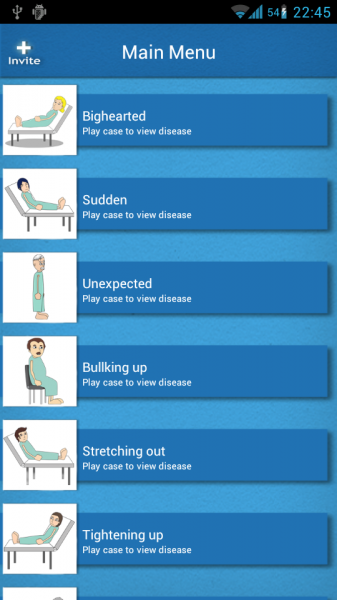 The app’s main screen labeled “Main Menu” lists the different cases the app has to offer. 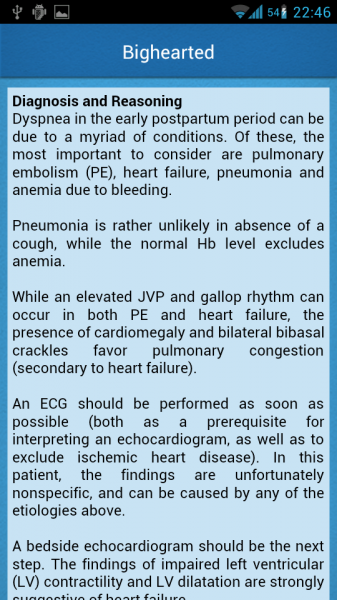 In contrast to the original “Prognosis: your diagnosis”, the cases here are not grouped into specialties such as “Medicine”, “Surgery”, “Gyn & Obs” and “Pediatrics”; it just displays Cardiology cases without distinction. When we select a case, the “History” tab provides us with the patient’s condition and other relevant information. There are also other tabs at the bottom of the screen that include: “Examine”, “Investigate”, “Manage” and “Finish”. 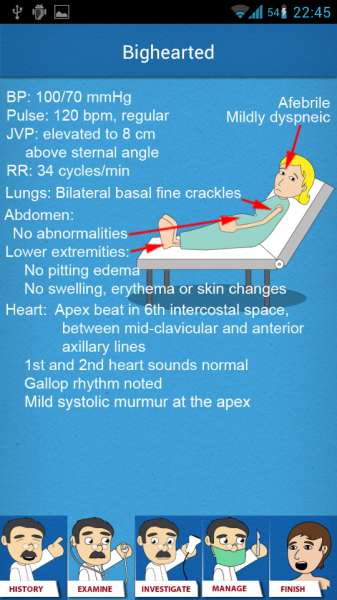 On the “Examine” tab, there’s a picture with clinical signs that we would find during the pertinent exploration. “Investigate” let’s us see a list of complementary studies we can order. 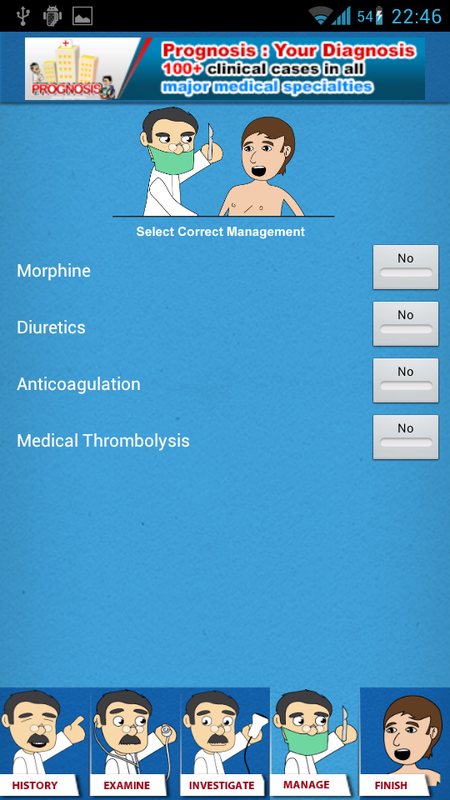 The “Manage” tab is where we input how to treat the patient’s condition. Tapping “Finish” ends the case and shows us how well we performed. Our results are graded “Poorly”, “Satisfactory” or “Very Well” and a detailed view shows a summary of our actions. The “Discuss” button will walk us through the case and provide references. We can also “Share” our results on Facebook so all our friends know how well we did. The app is fun to use. 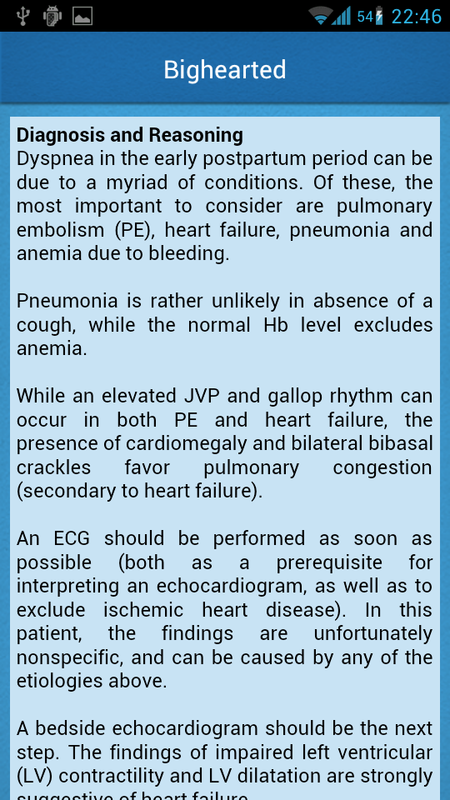 It’s a good app to practice your Cardiology knowledge. Multimedia Coverage: 2/5. Could have more images and sounds. Price: 3/5 Stars. The app is free and has good value. Real World Applicability: 3/5 Stars. This is not an app that would be used on a daily basis but has its use to practice and train.